Well, what a journey it has been! Hundreds of entries and many votes later and the Big Easy wedding we have all been waiting for has finally come together. What an honor and privilege it was to plan the ultimate wedding for Stephanie and Michael. 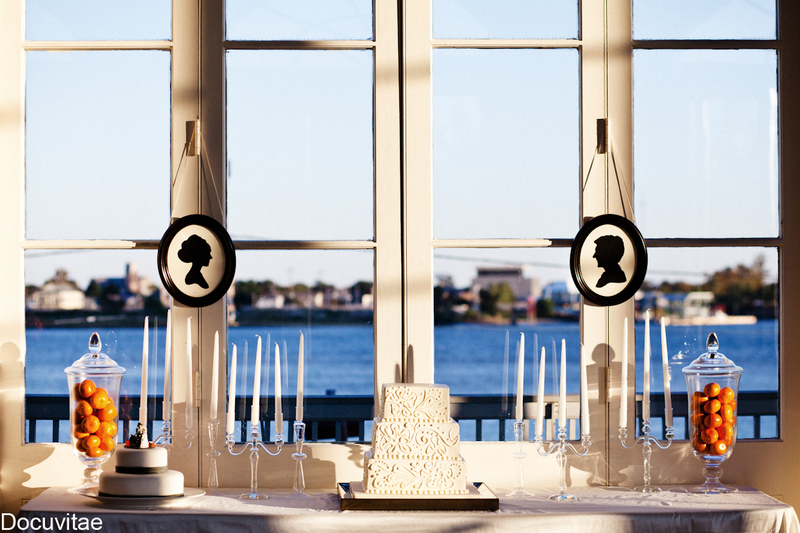 With New Orleans as the perfect backdrop for this romantic couple, and a lot of help from Crate and Barrel, my team and I set out to create a wedding to remember. To invite guests to the festivities, the couple chose to have Julie Gibson of Studio Grace create their passport inspired wedding invitations complete with a lovely fleur de lis inspired motif. As with all of our destination weddings, we tried to incorporate some local flavor into the wedding to allow the guests to feel a part of their new destination. As an appropriate welcome gift, Stephanie and Michael chose to give guests a box of Beignet mix from local favorite Café Du Monde with a special note from the bride and groom. For the ceremony, the bride and groom chose a most charming church to exchange their vows, St. Mark’s United Methodist Church located in the historic French Quarter. 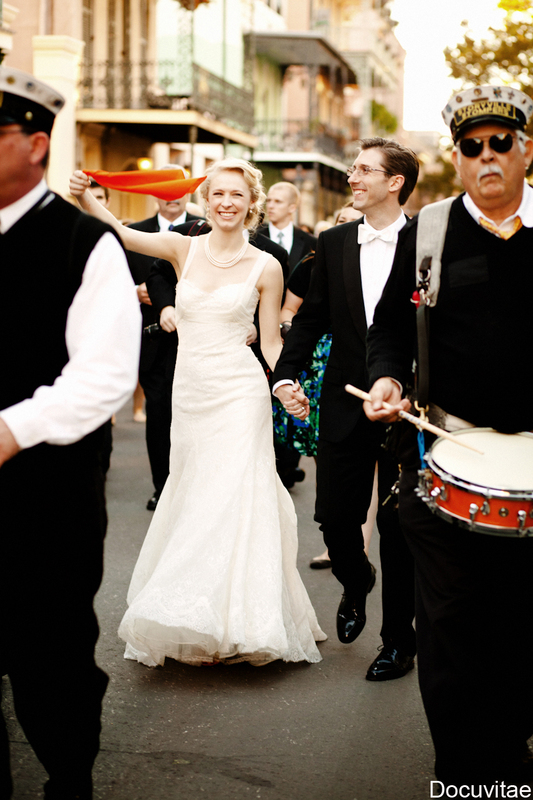 Once the ceremony ended, guests were in for a special treat as a New Orleans second line band led the bride and groom and their guests to the reception through the bustling streets of the French Quarter. What a fantastic spectacle, not to mention electrifying sound. 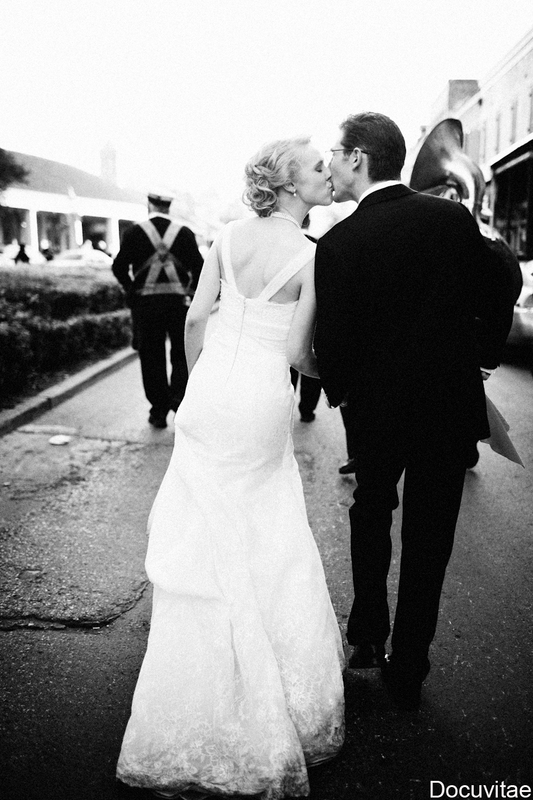 For our reception, we chose Galvez Restaurant, right at the heart of the French Quarter overlooking the Mississippi river. The reception décor: a plethora of candles and candelabras, baby’s breath filled in various vessels, and kumquats to add a special touch. We worked with Ambiance Florals right out of Mandeville, Louisiana. The room was glowing, literally, as were the bride and groom! For a personal touch, the couple chose to toast with Sekt Champagne (the bride and her family’s favorite) specially imported from Germany for the wedding. We decided to showcase the wedding cake and groom’s cake (I love that southern tradition) on a lovely dessert display made up of some of our favorite Crate and Barrel items. We even used the Crate and Barrel DuBois Mirror as the wedding cake platter. The groom’s cake was made by Courtney Schmidig, the couple’s friend and head pastry chef at the French Laundry in Napa. As for the wedding cake, it was made by local sweet shop and bakery, Sucré. Needless to say, the dessert station was one not to be missed. 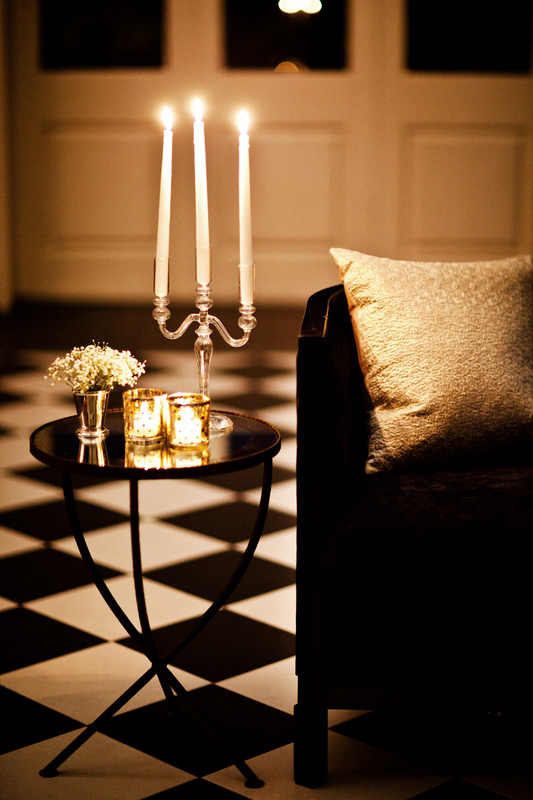 After a decadent family style dinner, our guests were invited into the lounge. We tried to stay true to the room and our surroundings, and chose these gorgeous metallic pillows and Raj Candleholders all from our friends at Crate and Barrel and CB2. We had much fun looking through the many beautiful items from Crate and Barrel and figuring out what we would like to use for the wedding, I might compare it to being a little kid in a candy shop. 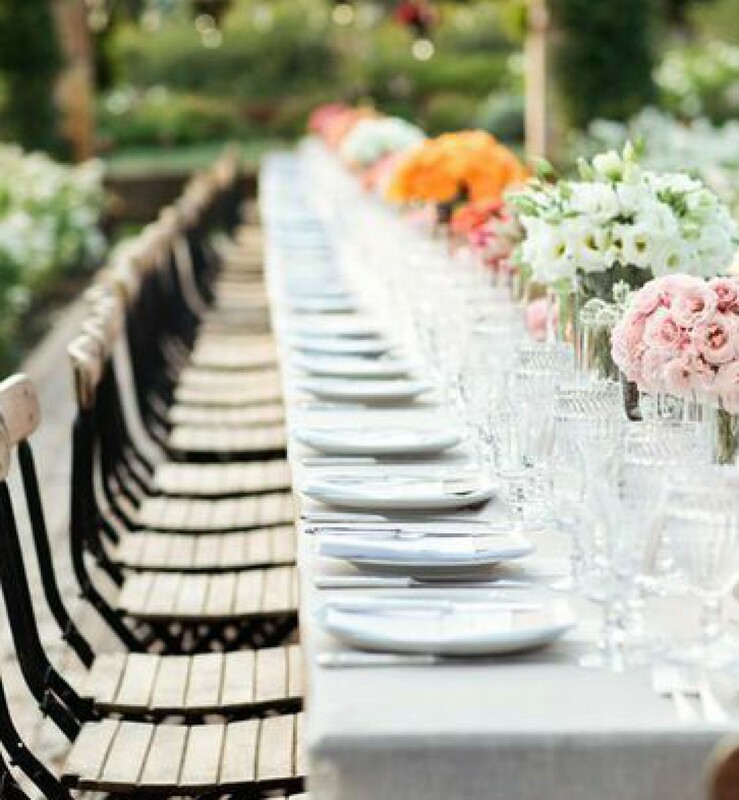 The various elements of this wedding truly came together magically. And now for the “thank yous”, as a wedding never is a solo project; it takes a truly stellar team to put a wedding together and we were quite privileged. A big thank you goes out to the lovely and talented Laura Kleinhenz from Docuvitae, for capturing the wedding so beautifully through her photos. 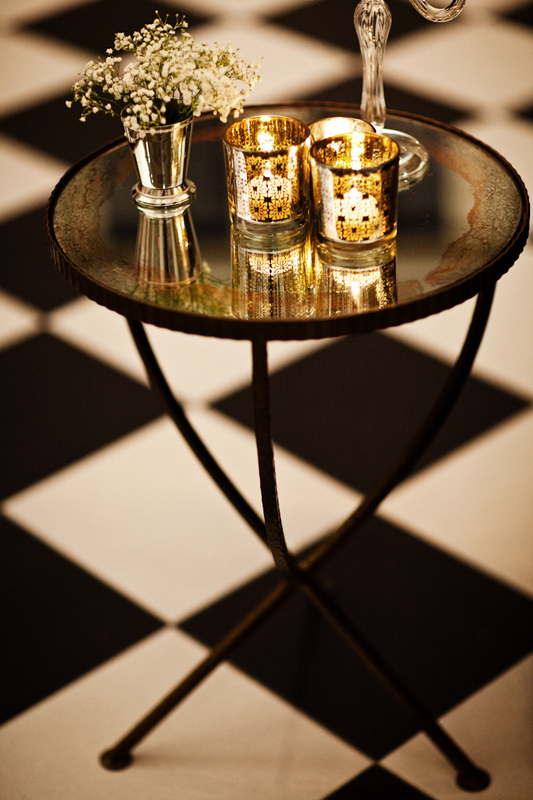 Thank you to the amazing team at Crate and Barrel who have been great to work with and who supplied us with wonderful décor items. A huge thanks to Stefanie Cove and Ashley Sharf on my team who execute everything flawlessly and worked tirelessly. Another thank you is owed to the wonderful staff at the Galvez Restaurant and the energetic Taboo Band who kept the guests dancing throughout the night. And lastly, a special thank you to the city and incredibly friendly residents of New Orleans who made this a most fantastic experience for all of us. Congratulations to sweet Stephanie and Michael…. And as they say in NoLa, laissez les bontemps ruler.